When using default Squid proxy versions 3.4 (in CentOS/RedHat 7) and 3.3 (in Debian/Ubuntu) and Google Chrome/Chrominum as web browser the following issue occurs. 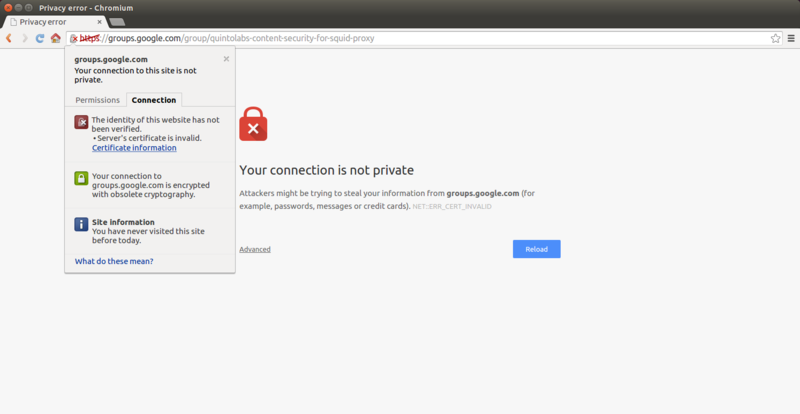 After enabling HTTPS filtering and SSL decryption Google Chrome starts to show Your Connection is not private (NET::ERR_CERT_INVALID) error message as indicated on the following screenshot even if proxy certificate is installed as Trusted Root Certification Authority. The reason for this is simple - Squid uses default SHA-1 signing algorithm to generate mimicked certificate to perform SSL decryption. This leads to warning because of http://googleonlinesecurity.blogspot.co.uk/2014/09/gradually-sunsetting-sha-1.html. This behavior was fixed starting from Squid 3.5.1 (see discussion at http://comments.gmane.org/gmane.comp.web.squid.devel/23450). Current version of Web Safety completely resolved all issues with SHA1 certificates and should function correctly.